This week's tablehopper: starry nights. The sun was just setting while the fires were burning at Long Meadow Ranch’s Live Fire guest chef series this weekend. Photo: © tablehopper.com. It was such a pleasure to watch the James Beard Awards while I was eating my fava bean pasta last night in my caftan (it’s a lifestyle), with the warm spring air (or is this summer?) coming through the windows of my apartment. Spring fever, it’s real. Congrats to all the winners (and nominees! ), but especially to chef Corey Lee for Best Chef: West—it was so well deserved and a long time coming to one of the hardest working chefs in the biz. He’s one of the chefs you almost never see out of his kitchen, and he certainly wasn’t at my after-hours chef party in honor of Jeremiah Tower last week. (Trust me, I tried!) You can read the recap of the JT industry party in today’s hopper. Yes, there was caviar. Okay, so it’s true, no rest for the weary. I’m leading a group of 28 U.K. restaurateurs and bar/pub owners through San Francisco all day and night this Friday and Saturday, so you can only guess at all the things I need to be doing. And writing (I have two deadlines this week). And I leave for Thailand May 18th. Mamma mia. Gotta keep the espresso pumping in my veins for the next two weeks. One last note for today! Next Friday May 12th is the tablehopper Blue Fox vintage dinner at Alfred’s, and I just released the final 10 tickets, so hop to it! Let’s drink martinis. 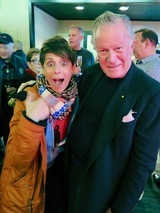 Yours truly with Jeremiah Tower and director Lydia Tenaglia. Photo: Eric Wolfinger. Campari America cocktails (cosmos and lemon drops!) in the house! Photo: Eric Wolfinger. Spoon feeding Jeremiah Tower Jordan Chef’s Reserve Caviar. Mic drop. Photo: Eric Wolfinger. Dear friends, reunited: Jeremiah Tower and Denise Hale. Photo: Eric Wolfinger. 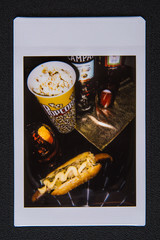 The best theater food ever: chef gourmet popcorn, Stars hot dogs, and Negronis! Photo: Eric Wolfinger. 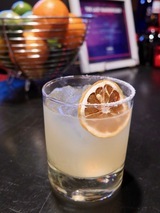 The lemon drop daisy, with Espolòn blanco. Photo: © tablehopper.com. Chef Dominique Crenn and Jeremiah Tower. Photo: © tablehopper.com. 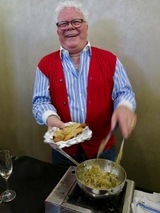 Howard Case serving up the Stars-meets-4505 Meats hot dogs! Photo: © tablehopper.com. 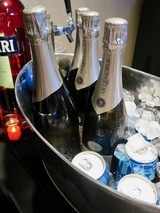 The antidote to a hot kitchen: Jordan Cuvée by Champagne AR Lenoble and Fort Point Beer. Photo: © tablehopper.com. “Can we bring Denise Hale with us?” When you get an email like that from Gary Danko, that’s when you know Jeremiah Tower should be really happy at your party (especially since we were going to keep her as a surprise). Yes, his swan of Stars was going to float into our event. Last Thursday evening, it was my great honor to host a chefs-only after-hours party and screening to welcome Jeremiah Tower back to San Francisco. While he was attending many events, screenings, interviews, and Q&As during the week for the release of his documentary, Jeremiah Tower: The Last Magnificent, I wanted to throw something a little more industry and special for him. I called it The Family Screening, a continuation of the previous after-hours events I have hosted for our local chefs. Sadly, some chefs got stuck in service and couldn’t make it in time for our 10:45pm screening. Such is chef life. But it was a lovely surprise to be able to have an impromptu Q&A with the deeply talented director Lydia Tenaglia (co-founder of the award-winning Zero Point Zero Production) and JT at the end of the film. I think it was around 1am, but fortunately we were on Negroni time! I couldn’t host these chef events without the ever-gracious and appreciated support of Campari America. They agreed we needed to serve cosmos and lemon drops in honor of what we all drank at Stars back in the day—’80s flashback! 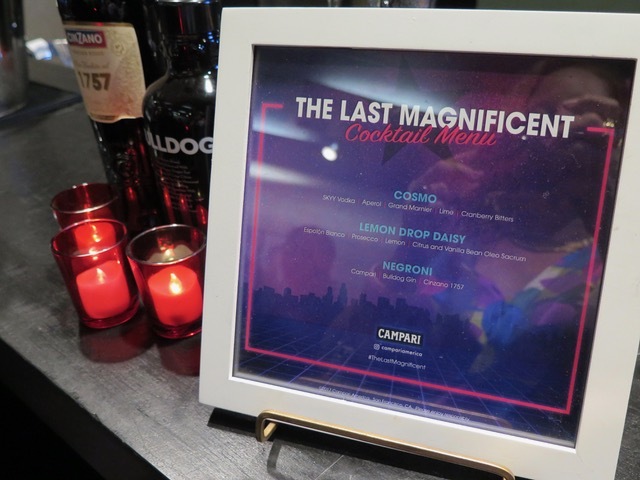 Rye on the Road created some updated versions for the party: the cosmo was made with SKYY (celebrating 25 years! ), muddled lime, dash of Aperol and Grand Marnier, cranberry bitters, with long lime zest, and the lemon drop daisy was made with Espolòn blanco, pressed lemon, citrus, and vanilla bean oleo sacrum, shaken and topped with splash of prosecco, with a dehydrated lemon and sugar rim. (We made sure to serve everything in a rocks glass so the cocktails would fit in the theater cup holders, heh-heh.) And it wouldn’t be a chef event without Negronis. There were also some tequila shots that may have happened, but I am not responsible for those. As Jeremiah said at the end of the screening, all movies should be screened with lemon drops! Agree. Of course there had to be Champagne! Tremendous thanks to Jordan Winery, which provided our guests a sneak peek/advance taste of the Jordan Cuvée by Champagne AR Lenoble. It’s a special bottling of nonvintage brut from Champagne AR Lenoble, which will be debuting on May 13th (you can attend the release party!). It was also my great delight to hand-feed JT and Mrs. Hale a heaping spoonful of the Jordan Chef’s Reserve Caviar by Tsar Nicoulai, and then place the jar into his hand and tuck my mother-of-pearl spoon into JT’s pocket, which he should always have there, now that I think of it. I was also gifted a bottle to pour of 2007 Perrier-Jouët Belle Epoque Champagne from Kim Beto of Southern Wine & Spirits (I heard “PJ fleur” was one of JT’s favorites), and he brought it into the theater to share with Denise during the film. Howard and Kris Case of Casa de Case were huge Stars regulars and credit JT with inspiring and supporting them in their decision to follow their passion and start their Italian import company. They helped re-create the Stars hot dog that used to be served at the bar: Kris made the sauerkraut (with duck fat, white wine, and botanicals), which Howard served over 4505 Meats hot dogs (thanks, 4505—we could only have the city’s best dog at this event). There was also Grey Poupon Dijon, per the original specs. We were going to have plenty of hungry chefs coming off service, so leave it to Casa de Case’s chef Colin Dewey to completely rock the popcorn service. It was the most gourmet theater food ever, I swear. We had Parm Pop, with 24-month Parm, oregano, and peperoncino, and Fish Pop, with colatura di alici, garlic, lemon, anchovy, chile, and bottarga grated on top. Outstanding. I want this in my life all the time. We also had cases of cold beers from Fort Point Beer (their refreshing KSA and Villager IPA were there to greet chefs emerging from hot kitchens), and huge merci to Le Marais Bakery, which donated BOXES of cookies, madeleines, and other sweet treats, plus some breakfast viennoiserie for chefs to tuck into their gift bag for the morning. Truly, so sweet. I want to give a very special thank-you to our other event sponsor, Poached, which really helped me pull this thing off! Couldn’t have done it without them. Their lovely team helped me at the event and also created a fun gift bag, which had some Jacobsen’s travel salt (love it), a Poached hat, and thanks again to 4505, we were able to stuff the bags with their famous chicharrones. It was like the ultimate chef to-go bag. Huge thanks to publicist John Weaver—who, like me, had fond memories of cosmos and lemon drops at Stars—and agreed that this party needed to happen. Thank you for making it possible! Mwah. When we talked about the image look and feel, I threw out the idea of taking Polaroids there, and damn, did he rock it. I didn’t expect him to show up with just a Polaroid camera, but wow, did the images turn out great. And that’s Eric—not only did he understand the chef dynamics in the room and all the players, but he managed to capture all my favorite moments. On a Polaroid camera. He also said that he will personally send anyone who wants their original Polaroid! What a guy. You can email him here. We missed you here in San Francisco, JT, thanks for coming back. Don’t be a stranger. And everyone, see this film. Lydia has created something very insightful and unique. It’s deep. Toast toast toast! At the new Nourish Cafe. Photo: Rebecca Kinney. A look at the soon-to-be-loaded case at Kahnfections! Photo courtesy of Kahnfections. Bring on the blended margarita at Glena’s. Photo: Sean Jerd. 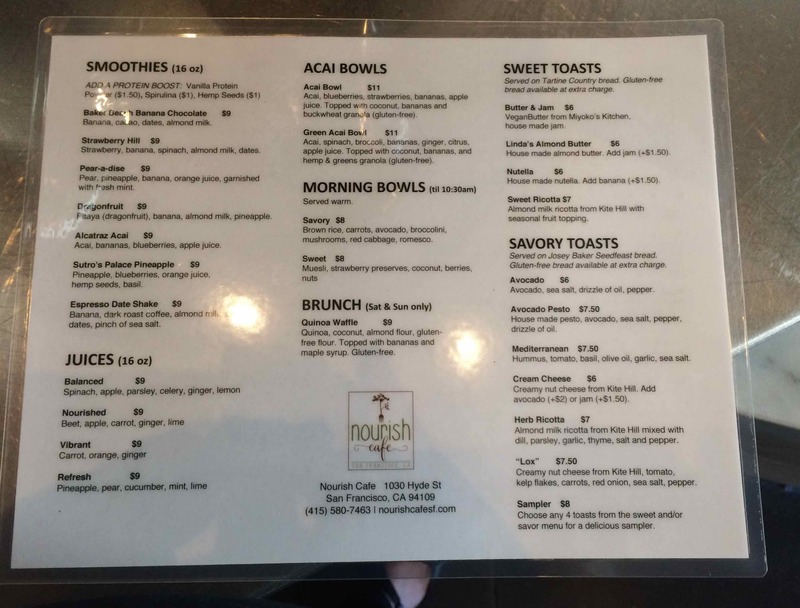 Last month, I mentioned the 100 percent plant-based and organic/non-GMO ~NOURISH CAFE~ was opening a second location in the former Flour & Co. on Hyde Street in Nob Hill, and boom, it’s open. They are offering all kinds of vegan items; take a peek at the menu here. There are smoothies, Stumptown Coffee espresso drinks, and kombucha on tap as well. Hours are Mon-Fri 10am-7pm, Sat-Sun 9am-3pm. 1030 Hyde St. at California. Back in March, I let you know about the bakery opening in the former Green Heart Foods space in the Mission, and now ~KAHNFECTIONS~ is soft opening this Friday May 5th at 6am. Come by for Judy Kahn’s biscuits, croissants, muffins, and scones, plus dessert items and favorites like cookies and carrot cake. Egg sandwiches will be coming down the road too. Hours Sat-Sun are 8am-3pm and then Mon-Fri 6am-3pm. 3321 20th St. at Folsom. Just in time for Cinco de Drinko, ~GLENA’S~ can finally start whipping up their blended margaritas starting Wednesday May 3rd to go with your tacos. Chef Michael Gaines and partner Stephanie Gaines are working with bar manager and program designer Lachlan Bray (Kin Khao, Tosca). Other cocktails on the menu include a Paloma, El Marinero (mezcal, rhum, Aperol, pineapple, lime), The Federale (Jamaican rum, Punt e Mes, vermouth, Ancho Reyes, bitters), Si Señor (gin, Cocchi Americano, lemon, seltzer), and Baja ha ha (vodka, Suze, ginger, passion fruit, lime); all $12. Hours are Sun-Thu 11am-10pm and Fri-Sat 11am-11pm. Arriba. 632 20th St. at 3rd St.
Another menu change is coming to ~CAFE DU NORD~, which is shifting back to being a live music venue and streamlining the food menu. Bye-bye, amazing late-night burger. Hoodline confirmed Ne Timeas and The Bon Vivants are no longer working with owner Dylan MacNiven on Du Nord after the big relaunch they did, although they are still involved with Aatxe and Swedish American Hall. It sounds like there will be some food served; stand by for details on all the changes soon. 2174 Market St. at Sanchez. The patio at Arguello. Photo: © Henrik Kam 2014. —Lunch on the outdoor patio at ~ARGUELLO~ in the Presidio, where you can soak up the sun while enjoying $7 margaritas all day and $12 buckets of beer. Great chips and guac and carnitas and grilled shrimp tacos await. —The weather is probably going to be gray again on Friday, so head over to Sausalito and enjoy margaritas on the patio at ~COPITA~ and wish them a happy fifth birthday! —Enjoy hot Latin beats, performances at midnight, and tamales at Juanita MORE’s Cinco de Mayo—House of MORE! fiesta. At the ~OASIS~ in SoMa, 10pm-3am. $10 in advance/$15 at the door. —And now for some real talk: on Friday, restaurants throughout Berkeley and other Bay Area sanctuary cities will take part in Cocktails for La Causa to raise awareness of deportation and immigration issues and support local organizations providing legal defense. Funds collected from the sale of food or drink specifically created for this event will be donated equally among Centro Legal de la Raza, the East Bay Community Law Center, and the Multicultural Institute in Berkeley. Please check the list to see who is participating in Berkeley, which has been a City of Refuge since 1971! Tikka masala mac and cheese at Navi Kitchen. Photo courtesy of Preeti Mistry. The bar at Paradita Eatery. Photo by David Escalante. 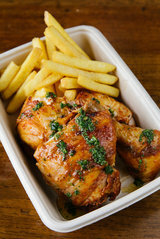 Pollo a la brasa at Paradita Eatery. Photo by David Escalante. Last fall, I mentioned Juhu Beach Club’s Preeti Mistry was opening ~NAVI KITCHEN~ in the Bakery Lofts in the Triangle neighborhood of Oakland and Emeryville, and it’s now softly open and serving breakfast. The menu includes a Mumbai Morning Burger ($8.45), with pork ginger sausage, fried egg, American cheese, pepper cress, and ghost pepper chutney, while the Croque Gadame ($8.45) has brown sugar chai-spiced bacon, fried egg, white cheddar, pickled onions, and tamarind ketchup. There are a couple of vegan toasts, too, plus coffee service (and DIY chai!). 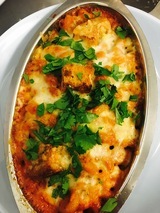 Lunch starts this week (salads, subs, soups, and can we TALK about tikka masala mac and cheese? ), and nighttime Indian pizzas are coming soon, I’ll keep you posted. And there’s a patio, sweet. [More on Nosh.] Open now Wed-Sun 8am-3pm. 5000 Adeline St. at 47th St., Emeryville. Newly open in Public Market Emeryville is chef Carlos Altamirano’s ~PARADITA EATERY~, a fast-casual spot focused on Peruvian street food. (He’s also behind Mochica in SF’s Potrero Hill and Piqueos in Bernal Heights, plus La Costanera in Montara, Parada in Walnut Creek, and the Sanguchon food trucks.) Check out the menu here, which covers organic salads, Peruvian sandwiches (like lomo saltado), grilled anticuchos (meat skewers—bring on the beef heart), pollo a la brasa (Peruvian rotisserie chicken, made with Mary’s organic free-range chickens), a variety of rice bowls, sides and alfajores for dessert, oh you know it. And there are cocktails, including pisco sours. Fun fact: did you know Altamirano founded Alta Farm in Half Moon Bay, dedicated solely to producing the spicy rocoto variety of pepper? He wanted to be able to have it fresh instead of frozen. Dedication! Open daily 11am-9pm. 5959 Shellmound St. at 59th St., Emeryville. Open in the former Salsipuedes in Oakland’s Longfellow neighborhood is ~THE KEBABERY~ from Camino’s Russell Moore and Allison Hopelain, and partner Brian Crookes, with chef Traci Matsumoto-Esteban leading the kitchen. (It’s inspired by their Kebab Mondays at Camino.) The menu allows you to choose your kebab plate (herby lamb kebab, marinated chicken kebab, spiced king trumpet mushroom kebab, and fried cauliflower kebab, which is also GF) and side salads (carrot salad, mashed beets, sauerkraut salad), plus yogurt, pickled chiles, herbs, and your choice of grilled flatbread or red lentils—or you can have a kebab sandwich. Other specials include a bowl of soup with yogurt and fried spices, one salad, and a grilled flatbread. Chocolate pudding for dessert, and beer and wine. It’s casual, counter service, and they’ve made it easy for takeout. Open Wed-Mon 5pm-9pm. 4201 Market St. at 42nd St., Oakland, 510-922-1601. I mentioned a couple of weeks ago that ~ADESSO~ was sadly closing, and to reconfirm, their final day of service will be Saturday May 6th. Was also sad to learn that West Oakland’s quirky ~FUSEBOX~ has closed after five years of feeding us. Damn, those wings have left us. You can read more on Nosh. The Cheshire Cat by Kate Bolton for the Mavericks menu at Lord George. Photo: Allison Webber. The Lord’s Platter at Lord George. Photo: © tablehopper.com. The Queen of Hearts by Kate Bolton for the Mavericks menu at Lord George. Photo: Allison Webber. I know I’m not the only one missing Kate Bolton’s smiling face behind the bar at Maven as she makes you a killer cocktail (Portland, you are lucky to have her!). But there’s a second best solution happening right now at ~LORD GEORGE~ in South Park, and it’s her Alice in Wonderland-themed cocktail menu for owners Miles Palliser and Ezra Berman’s Mavericks series (their new seasonal guest bartender series). The cocktails are creative, delicious, and if you’re lucky, you’ll be sitting at Mike Zengle’s station, who will fill you in on as much as you’d like on what you’re drinking and how your cocktail was made. I recommend starting with the Through the Looking Glass (fino sherry, amontillado sherry, dry vermouth, blanc vermouth, with housemade lavender and orange bitters), a perfect pairing with their well-shucked oysters on the half shell. 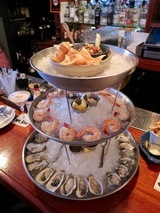 You can always pony up for the Lord’s Platter, which will make everyone around you say, “Oh my Lord!” You get a three-tiered platter styled with 24 oysters, 12 Gulf prawns, and a silky tuna tartare (which is more like a tasty poke), $119. Get a group together (or just a few of you) and do it up. The White Rabbit is another beauty to start with (Lillet blanc, yellow Chartreuse, sherry, mint, lime, egg white), and I say pair it with chef Nick Adams’s foie gras torchon. The Dee & Dum is like a mojito, with dueling rums (overproof Jamaican and Guatemalan rums), velvet falernum, grilled strawberry syrup, shaken with basil, and lime, with a torched orange. You’ll chuckle when you see the Drink Me (a “wee” bottled serving of whiskey, cherry, absinthe, and bitters), and the cherry is a reference to the cherry tart mentioned in the movie. It’s a really well-thought-out menu, and mighty tasty. There are 11 drinks in all, and the bar will donate 50 cents of every Maverick cocktail sold to the guest bartender’s charity of choice. Sweet! Kate’s menu runs through June 30th, so don’t be late, for a very important date! 555 2nd St. at South Park, 415-660-7633. Blood and Sour Fizz, paired with agedashi celery root. Photo: Wes Rowe Photography. Seaweed and avocado salad. Photo: Wes Rowe Photography. Prepare thy livers, the next wave of Over Proof at ~ABV~ is starting, Double Back, and it’s going to focus on whiskey! As you may recall, ABV is rotating different concepts each quarter. For Double Back, guests will be sipping whiskeys of the world (from Scotland, Japan, and the U.S.), both straight up and in cocktails, with snacks paired to boot. The look is meant to evoke a saloon-type whisky bar in Tokyo, and chef Colin will be preparing a menu with some Japanese influences. Double Back runs May 3rd-July 28th. Seatings will be 7pm on Wednesday and 7pm and 9pm Thu, Fri, and Sat. $60 plus tax and tip, and tickets can be found here. Actually, I don’t know what she had, but I do know former U.S. Secretary of State and National Security Advisor ~Condoleezza Rice~ came in to ~A16~ for dinner last Wednesday night. We’re looking for passionate, highly motivated, hardworking prep/line cooks who are interested in contributing to a positive, collaborative ramen-centric environment. Ramen Shop has been open for more than four years and our staff continues to grow in knowledge and skill. Our team is built around several former Chez Panisse floor and kitchen staff members. We have high expectations of ourselves and our staff and it shows in our food. The growing family of Mixt and Split restaurants is looking for talented front-of-house and floor managers and supervisors to join our team! This position is in a fast-paced environment with quite a bit of daily variance. Some responsibilities include overseeing food handling safety and catering execution; ordering, inventorying, and organizing product; as well as leading the team to daily success. All content © 2017 tablehopper, LLC. I am more than happy if you want to link to my reviews and content elsewhere (thanks, glad you dig it), but republishing any part of them in any way, shape or form is strictly prohibited until we talk first. Please take a look at my Creative Commons license for more detail.